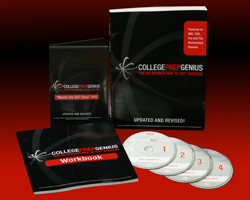 I have been familiar with CollegePrepGenius for a couple of years now, so I was pretty excited when Jean Burk agreed to let me review the program for her. My daughter is a junior this year, and she has big plans for college to study digital animation. She also wants to work for Disney, Pixar, or Dreamworks. As you can imagine, the college she wants to attend is pretty expensive. We are going to need all the help we can get financially, so her SAT scores have got to be amazing! smart students don't do well on the SAT because they simply don't understand it. From the CollegePrepGenius textbook, "Instead of studying content, these students need to study how the tests themselves are set up and how the questions are written to determine how to answer them correctly." You see, as the questions are standardized, the same types of questions come up over and over again. "Understanding the logic behind the questions is the key to test success." How frustrating would it be to see your student study diligently and not do well, even taking the test several times? With CollegePrepGenius, your student can take the SAT with confidence knowing how the test is structured! Time management: Learn the shortest way to the answer! SAT structure: Know each part and how much they count! Test objectivity: Questions are ALWAYS objective and NEVER subjective. Know the difference! Part II is focused on Critical Reading, Part III is Math, Part IV is Writing, and Part V is focused on the scholarship search. This textbook alone is 325 pages! This course also comes with 4 DVDs and a workbook. My daughter will be using this course as one of her classes during this school year as she will take the SAT in the spring. We can't wait to see the results! Visit the College Prep Genius website for more testimonials and a host of freebies just for signing up for the newsletter! 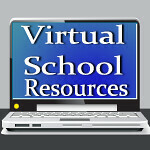 Be sure to subscribe so you don't miss a thing at Virtual School Resources! I was given the CollegePrepGenius course in order to write this review. While I do not have children close to being able to use this tool, I wish it had been available to me. This looks like a wonderful program and many HS students could benefit from it. Thank you for sharing! Yes! Attending few courses is expensive so such study material can be an amazing source to gain education. Textbooks and satellite classes provided by New York Bar Exam Course are definitely standardized. My friend is looking for online evening sessions for law entrance exam. Will join the same with her as filled the exam for coming attempt.